V&A Jewellery - Bows through the ages charm Bracelet: This delightful bracelet of miniature decorative bows represents distinctive 'bow' designs through the ages and is taken from six different sources and four different centuries - an English shoe buckle and a Russian bodice ornament both dating back from 1760, a West European pendant dating from 1630-1660, a French necklace from around the same period, and a silky day dress designed in London by Victor Steibel in 1947. 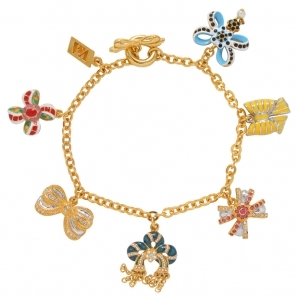 This bracelet is 24ct gold-plated with Swarovski crystals, enamel and a small pearl. This piece is inspired from an object in The Victoria and Albert Museum, London. V&A Jewellery - French Crystal Bow Earrings: Inspired by a late 18th century silver gilt vrooch with a pendant. V&A Jewellery - Blue Bow Brooch: The Blue Bow collection is inspired by an original necklace from around 1660, probably French, with a series of interlinking gold knots, lies behind the appeal of this variation. V&A Jewellery - French Crystal Bow Brooch: Inspired by a late 18th century silver gilt vrooch with a pendant. V&A Jewellery - Blue Bow Reproduction Bracelet: The Blue Bow collection is inspired by an original necklace from around 1660, probably French, with a series of interlinking gold knots, lies behind the appeal of this variation. V&A Jewellery - Blue Bow Motifs Earrings: The Blue Bow collection is inspired by an original necklace from around 1660, probably French, with a series of interlinking gold knots, lies behind the appeal of this variation. V&A Jewellery - Blue Bows Bracelet: The Blue Bow collection is inspired by an original necklace from around 1660, probably French, with a series of interlinking gold knots, lies behind the appeal of this variation. V&A Jewellery - Bow Clear Crystal Necklace: This eye-catching jewellery is inspired by a 1947 full-skirted day dress in silk grosgain with a large bow at the back- a style which symbolises post-war optimism and prosperity. V&A Jewellery - Blue Enameled Bow Pendant: The Blue Bow collection is inspired by an original necklace from around 1660, probably French, with a series of interlinking gold knots, lies behind the appeal of this variation. V&A Jewellery - French Crystal Bow Pendant: Inspired by a late 18th century silver gilt brooch with a pendant.